as researchers and educators to provide students with an opportunity to make lasting discoveries. With the technical knowledge and skills our graduate students gain, they are prepared to solve the critical national and global problems. 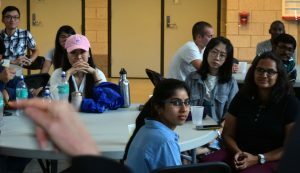 ME Department Chair Caroline Hayes spoke to graduate students during the fall 2016 welcome event for the Mechanical Engineering Graduate Student Organization (MEGSO). Not sure which degree option to pursue? Find out which one best fits your career path. Be sure to check out research programs to see what areas interest you. You can apply right now through our online application process. 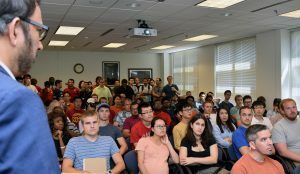 Dr. Pulickel Ajayan, Benjamin M. and Mary Greenwood Anderson Professor in Engineering at Rice University, spoke to a full house during the first graduate seminar of the fall 2016 ME seminar series. Application deadlines—January 15 for fall admissions; September 1 for spring admissions. Program and application requirements (including GRE, TOEFL score guidelines). Refer to the graduate handbook. Processes, forms, and other resources. Need something else? Contact megradinfo@iastate.edu.